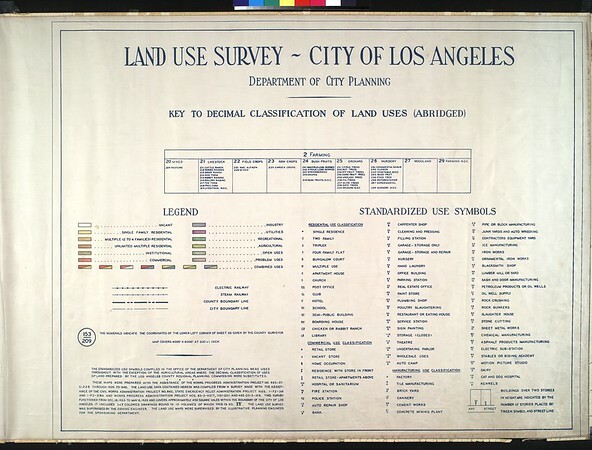 Land use survey - City of Los Angeles. Department of City Planning. These maps were prepared with the assistance of the Works Progress Administration project no. 665-07-G-226 through 1939 to 1940. The land use data contained herein was compiled from a survey made with the assistance of the Civil Works Administration project no. 642, State Emergency Relief Administration project nos. 1-F2-318 and 1-F2-318A and Works Progress Administration project nos. 65-3-4377, 1101-2011 and 465-03-3-106. This survey functioned from Dec. 18, 1933 to May 8, 1939 and covers approximately 460 square miles within the boundary of the City of Los Angeles. It includes 347 colored drawings bound in 10 volumes of which this is no. IV. The land use survey was supervised by the Zoning Engineer. The land use maps were supervised by the Illustrative Planning Engineer for the Sponsoring Department.